March 27, 2017 – This week, our time machine goes inside a succession of Nazi Concentration camps, and views them through the great Norwegian statesman, Odd Nansen. 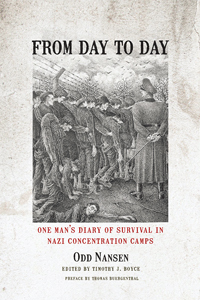 Editing Nansen’s diaries — written painstakingly and smuggled out of the camps — is Timothy J. Boyce, and the resulting book is From Day to Day: One Man’s Diary of Survival in Nazi Concentration Camps . As a friend of Norway’s royal family and son of a prominent anti-Quisling voice, the Gestapo snatched Odd as a hostage in an effort to keep patriot insurgents in check. If you heard my interview with Neal Bascomb, author of The Winter Fortress: The Epic Mission to Sabotage Hitler’s Atomic Bomb , you know that Norway holds a special place in our hearts, especially as it relates to their valiant resistance during the war.